With a crack of thunder, sudden darkness descends. There is disarray, confusion and a search for a flashlight until from the blackout a British woman’s voice crows, “Hang on, love. I’ve got one,” and a spot of light flashes across the stumbling visitors of the Audubon Store. The stage is set for the climax of “History Lesson,” the one-act play by Frankie Little Hardin that made its global premiere on the John S. Umble Center stage last weekend as the 17th winner of the biennial Goshen College Peace Play contest. Hundreds of submissions for the contest come from all across the country — and sometimes even the world — to be selected for production at Goshen College during the Homecoming weekend of every even-numbered year. From Dec. 31 of the previous year until June, the submissions are read by the selection team primarily composed of Goshen theater faculty. Once the winner is selected, the playwright is notified of their award. They receive a $500 cash prize and are invited to attend the performances and give talkback sessions afterward. According to Doug Liechty Caskey, professor and director of theater at Goshen College, the contest got its start in 1982 thanks to a sizeable anonymous donation. At the time, Caskey’s predecessor Loren Friese was in his first year as the head of the department. He produced the very first Peace Play contest winner, a show entitled “The Dove, The Hawk and the Phoenix” by N. S. Bert. He also added a second place and honorable mention award to be given when the committee deemed applicable. Anyone, playwright or otherwise, can submit a piece in the competition. However, the plays submitted must only follow two rules: first, they must only consist of one act, no intermission, and second, the theme of the work must be centered around a “broadly defined” theme of peace. Because of this second caveat, the works that Caskey and the selection team receive often encompass a plethora of topics and issues. Despite this, Caskey remarked that quite a few of the submissions still center on the theme of war, as many people’s first idea of peace is an absence of conflict. Those pieces are not disqualified in any way, but he noted that peace occurs in many different ways. “History Lesson” tackled themes of environmental peace while the 2016 winner, “Party Favors” by Cary Pepper, focused on peace within a bipartisan political climate. 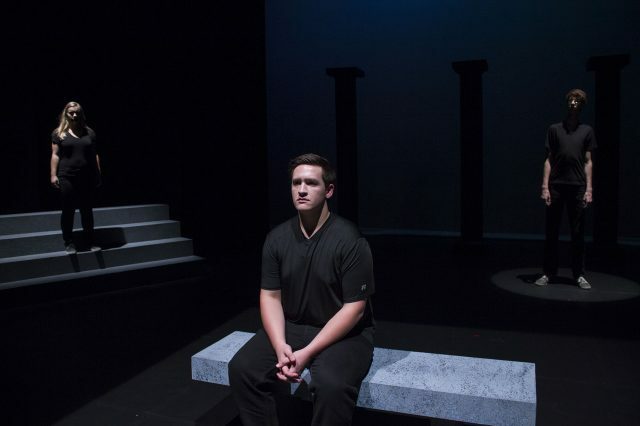 Typically, the Peace Play is directed by department faculty, but this year Ben Meyer Reimer, a senior music, theater and film production major, willingly stepped into the role. When asked about how he secured this opportunity, Reimer said the bottom line was being close with Goshen College theater faculty who had seen his work and knew what his goals were. At the end of the 2017-2018 school year, they simply asked if he would be interested in directing and Reimer jumped at the chance to refine his leadership skills as a director. Reimer mentioned that he usually prefers to make shows his own and make changes as they feel right with him and his actors, but “you always have to be a little wary when the live author is there,” he said, adding that it was a “fun challenge” to stick to the script and bring to life what Hardin created. Reimer also said that he enjoys working on world-premiering plays like “History Lesson” because there is no expectation for what the show will look like — it can be whatever the director wishes for it to be. The 2018 winner also set a historic precedent by becoming the first winner dealing with themes of environmental peace. A self-professed “tree hugger,” Hardin began writing the one-act after reading an article about Tim Gallagher, a researcher from the Cornell Laboratory of Ornithology who had traveled to Louisiana in search of the ivory-billed woodpecker. Although Tim appeared in “History Lesson” as a character, the play also tackled climate change and how human action affects the natural world. Submissions for the 2020 Goshen College Peace Play contest are being accepted now.